If you’ve ever needed a quick drag-and-drop interface to get Inkscape’s main tool icons into your drawing, I may have the perfect solution for you. With the introduction of the Symbols menu in the new Inkscape 0.91, you can easily create custom symbol libraries to make your work more efficient. If you just want to get straight to it, go ahead and download the symbols library here (unzip it) and simply place the SVG in your Inkscape/share/symbols/ folder. When you open Inkscape, you’ll find these in Object > Symbols and make sure you change the Symbol set to Inkscape Main Tools. Simply drag and drop the icon you need into your document. How cool is that? I should note an unfortunate downside to this particular library… these icons are bitmaps – not vectors! For whatever reason, adding gradients to custom symbols caused them to never display properly. My options were to either manually remove all of the gradients and compromise the visuals of the icons, or export large bitmaps of the icons. Why not make this a custom symbols tutorial in Inkscape? It’s very easy to do – just select an object and click the Add Symbol button in the Symbols panel. If you want to name the symbols, right-click on your object (prior to adding to symbols) and select Object Properties, then just change the ID. When you’re finished adding symbols, you can just save the document and move the SVG file into the Inkscape/share/symbols/ folder like we did before. 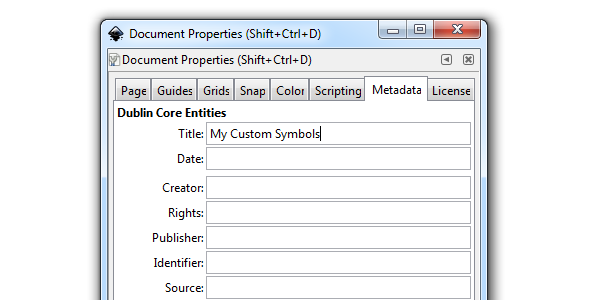 If you want to add a Symbol set name, just head to File > Document Properties and use the Metadata tab to add the Title. I hope you find the Inkscape main tool symbols library useful (even if it’s not vector). It’s very easy to create custom symbol sets as you can see, so go ahead and make some use out of this new, excellent Inkscape addition. Thanks for reading!